I came across a discussion item on LinkedIn a little while ago about “What frees you to achieve to your potential.” The individual posting the question focused on “self-discipline”…well, that was not what I had in mind when I read the discussion headline in my email. Here’s my response! As I considered that response, it reminded me of a section in the introduction of the DBT-CBT Workbook I wrote last year. 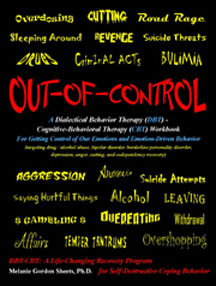 This section is entitled, “Saving Face: DBT-CBT in Action” and the text from this section is below. You’ve heard the saying about “stepping in it.” Well, I sometimes “step in it”…and the work of this book is no exception! I spoke to a professor at Texas A&M, Dr. Brian Stagner, about reviewing this workbook. He was my mentor during graduate school and he graciously agreed. Although I’m proud of this work, at the same time, I’m a little embarrassed by it! That’s a dialectical problem by the way! I figured he’d be impressed by the content, but stunned by the language and grammar…so, I never sent it to him! Part of DBT-CBT is Choosing Our Battles and Taking a Stand and Fighting for what’s MOST IMPORTANT to us…NOT EVERYTHING in life. It’s also about being prepared for and accepting the consequences of our behavior and choices. It’s also about being wise…and we’ll see if I made a wise choice! I expect to take some hits on grammar, like dangling participles, commas instead of semicolons, overuse of contractions, pronoun and antecedent disagreement, Texas slang, and other informal language and grammar. The truth, I wrote this for the average person and in a language many people speak…except for some southern slang! It wasn’t written for a professional audience, though I hope many in that audience will read it. I’m an informal, “down-home girl” and I wrote this for “down-home people.” I CAN BE formal if I have to be, but I certainly PREFER NOT! Another criticism I expect is repetition in the workbook. I tried to write this as I would speak it and teach it in Group. When I teach important principles and concepts, I often repeat myself by explaining the same thing in different words…one sentence right after another. Sometimes, hearing something said in different ways helps us to understand and remember it better…and if our minds have wandered, maybe we’ll get it the second or third time around! I’m very invested in the people I work with…and I’m passionate about doing my part to change lives. I drill home some points because this is intended to be a learning AND recovery experience. It’s NOT designed for casual reading or entertainment purposes! You’ll notice some repetition across chapters. My belief, most people don’t have audiographic memories…like they hear something once and remember it. My goal is for people to understand and remember these life-changing principles, concepts, and skills…so they’ll be equipped to apply them in Real Life. Many of us are hard-headed and need this information drilled into our minds. We may not WANT to hear some things and we may not be ready to look at or process some things. We usually have to be emotionally MOVED before we DECIDE to make difficult life changes. Being MOVED often involves looking at the Big Picture of Reality until our eyes are opened and the truth sinks in. Further, to learn how to carry out these skills and to live these concepts…we need to live, eat, and breathe this information until we know it so well we can repeat it back to ourselves. We LEARN by repetition. Also, everyone doesn’t read a book cover to cover in a few days. When time goes by, a review of important principles and concepts helps us to get the most out of what we’re reading. Further, when we’re stressed out by life, our brain is working full capacity to survive and meet here-and-now demands…and it isn’t always so able to fully process and learn new information. On top of all this, some of us have used a lot of drugs and alcohol, are aging, on medications, or have had head injuries…and our attention, concentration, and memories aren’t like they used to be! Also, some folks have had learning problems all their lives. Others may have symptoms of mental illness which affect their ability to concentrate. In my mind…REPETITION IS GOOD! The last point of embarrassment is…there WILL BE errors and typos…and Lord, I hope not…lost lines…where they disappear when the document is printed. I know I’m obsessive-compulsive…a perfectionist in many ways. I could review this book for ANOTHER year…and continue to make changes. However, if I don’t GET ‘ER DONE…it’ll be half of forever before it’s in print and can be helpful to people who are HURTING and SUFFERING. Getting this in print is much more important than perfection and my ego. Some folks don’t like how I’ve used CAPITAL LETTERS. I took some out, but left many. Again, I’m trying to drill home points. The capital letters are intended to draw attention to important principles and concepts…things I really want folks TO GET and be aware of! Sometimes, they’re for emphasis (like to say louder when we’re reading), but most often they’re there to highlight a point. The capital letters may make reading a little difficult until you get used to the writing style. So, I resolve my dialectical problem of being both proud of this work and embarrassed by it. I realize I want to print the PERFECT book to please a professional audience…however, I also recognize this book is for the average person who desperately seeks recovery. THAT IS its value and purpose. I ACCEPT that no matter how obsessive-compulsive and perfectionistic I am, I’m not perfect and I’ll make errors despite my best efforts to avoid them. I also understand that although I’m a highly educated professional, it’s not my spirit to interact with the world in a formal manner. I’m different, I’m down-to-earth, I am ME…and I’m okay. Some people will accept and embrace this work…others will criticize it. I understand some people will find fault no matter what…but, I’ve “stepped in it” and have set myself up for criticism because I haven’t used proper grammar or writing rules. I’ll take my hits, do Damage Control, fix things as I see appropriate, and I’ll move on down the Recovery Path…and on with life! Perhaps our paths will cross as we journey through the Pathways of Recovery. Hope to see you there. So, what frees you to be yourself…and to be who you were designed to be…and to do what you were designed to do?